Environment lovers have their own unique ways to let the world know that they are bothered about the world going round the bend with heat. While a few choose to be outspoken, a few others let their art do the talking. 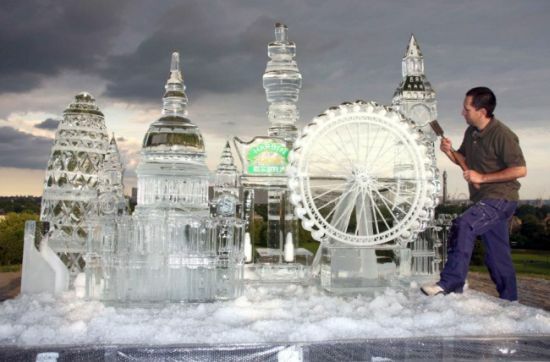 Percy Salazar has decided to challenge global warming by displaying sculptures of ice which depict the London Landmarks like the Big Ben, the Post Office Tower, The London Eye, St Paulâs Cathedral and the Gherkin Building at the height of the British Summer. Displayed at the top of the Primrose Hill, these chilling models revived a warm appreciation from the spectators. The real intent or rather the secondary purpose from an eco-lovers eye was to promote China’s oldest beer Harbin for the London food festival that is sponsored by the brand itself. Such Ice-structures are spoken off Harbin where they are found aplenty for itâs a celebrated tradition there. More images after the jump.